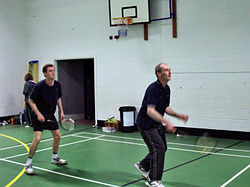 Ilkley Badminton Club is a long-established and enthusiastic club in the Wharfe Valley. Members range in age from 16 to 60, and love to play badminton in a friendly atmosphere. We encourage a wide range of abilities and standards of play - from high level local league to recreational players. Please note that we do not cater for beginners or offer coaching, but are pleased to develop people who meet minimum playing standards. We play socially at our weekly club night, but also competitively. There are 5 Ilkley teams in divisions 1 to 4 of the Bradford league (2 mixed, 1 ladies & 2 mens) and also a mens and mixed team in the Leeds league division 3. Our club is ideal for people looking to play a mixture of social and competitive badminton. Club nights are regularly on Mondays at Westville House School, Ilkley, LS29 0DQ. Home matches are played at St Mary's School, Menston on Thursday evenings, and away matches can be any night and occasionally at weekends. If you enjoy badminton and would like to visit the club please contact us. Approach on the A65 Bradford Road from Leeds or Bradford direction. Turn in to St Mary's School at the entrance marked with two standard blue 'IN' signs. Drive in 40 yards and turn right just before reaching the school building, then immediately right again to enter the car park. From the car park, walk back to the school entrance marked 'Pupil Entrance' and go in. Walk past Reception and through the double doors at the far end of the reception area. Turn left and walk to the end of the corridor, through doors that take you outside the building. Walk directly across to steps with white railings and down the steps. Enter through doors and down blue steps, through doors, turn right, through doors, turn left. Pass down the corridor with changing rooms to your right, then down a small flight of steps to the sports hall door. Please not the centre is undergoing refurbishment at present and the main entrance off the Green is closed. There is a temporary entrance from the Leisure Centre car park, which is opposite the Scout Hut/School. If you are approaching from Leeds on A65, before reaching the traffic lights (Esso Garage) turn right onto the iron bridge over the river Wharfe, then turn left. Take your next right up Carters Lane, follow the road up the hill where you will see the white building of the school. The car park is to the right. Access to the sports hall at the back of the school is via a wooden gate at the back of the car park.